The journal is the first and most reputable in Russia and EurAsEC (Eurasian Economic Community) countries peer-reviewed periodical that publishes materials on new medical technologies, economic optimization of drug therapy, quality-of-life and healthcare problems. The journal was founded in 2008. The impact factor of this journal, as shown in the Russian Science Citation Index (RSCI) is the highest among the periodicals in the areas of pharmacoeconomics, health technology assessment, and epidemiology. According to RSCI, the biennial impact factor (without self-citations) was 0.325 in 2013, 0.411 in 2014, and 0.722 in 2015. The journal publishes various materials on pharmacoeconomics and pharmaco-epidemiology including the methodology, data analysis and results of studies on public health, medical technologies and economic aspects of drug therapies. 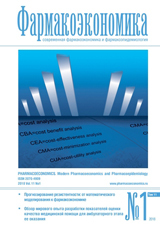 The original articles and literature reviews cover Cost-of-Illness Analysis, Cost-Minimization Analysis, Cost-Effectiveness Analysis (CEA), Cost-Utility Analysis (CUA), Cost-Benefit Analysis (CBA), Quality of Life Assessment (QoL), Patients' Preferences & Patients’ Satisfaction indices and related topics. Our aims and priorities focus on scientific and information support to the decision-makers and experts in public drug supply, health providers, research and education professionals, as well as pharmaceutic and insurance companies. Periodicity: 4 issues per year (quarterly). Copies of this journal are distributed under the Creative Commons Attribution 4.0 License: full-text materials are freely available to the public in an open access repository. The editorial board of “FARMAKOEKONOMIKA. Modern Pharmacoeconomic and Pharmacoepidemiology” includes leading experts in pharmaco-economics, clinical pharmacology, medical technology assessment, epidemiology, and public health from Russia, USA and Spain. The editorial board maintains the policy of full compliance with all principles of publishing ethics. Our ethical standards and codes conform to those of top international science publishers. All submitted materials undergo a mandatory double-blind peer review. Media Certificate of Registration: ПИ №ФС77-32713 of August 01, 2008. By the decision of the Higher Attestation Commission (HAC) of Russia, “FARMAKOEKONOMIKA. Modern Pharmacoeconomic and Pharmacoepidemiology” is included in the "List of top peer-reviewed scientific journals and publications" where scientists seeking academic degrees are required to publish their results. The journal appears in the Russian Universal Scientific Electronic Library (RUNEB) elibrary.ru and is also present in the database of the Russian Science Citation Index (RSCI). Concise versions of major articles from this journal are published by the All-Russian Institute for Scientific and Technical Information (VINITI). The journal is also indexed by "Ulrich's periodicals Directory" – a global information system of periodicals and continued publications. The aim is to analyze the medical records of patients with malignant lymphoproliferative diseases (LPD) in the Russian Federation in 2016- 2017. Materials and methods. Treating physicians in 75 regions of the Russian Federation were asked to fill the survey questionnaire containing 9 types of malignant LPDs (according to the ICD-10 classification). The questions covered the epidemiology of LPD (prevalence, resistant forms, relapses and mortality), the existence of specialized institutions and beds, the costs of medical care in patients with malignant LPD, and the financial support of pharmacotherapy in these patients during their hospital stay. Results. We found that the most common malignant LPD in 2016-2017 was Hodgkin’s lymphoma (73.5 and 73.4%, respectively). The prevalence of resistant forms and recurrences of malignant LPD over this period accounted for 6.8% of the total patient population. In 2017, the number of patients who died was 7.5% less than that in 2016. There are 815 and 1,763 specialized institutions of the oncology and hematology profiles that provide medical care to children and adult patients, respectively. Among the malignant LPDs, the highest costs of drug therapy in 2016 pertained to lymphosarcoma, and in 2017 – to Hodgkin’s lymphoma. In the system of compulsory health insurance (OMC), the largest spending for both adult and pediatric patients in 2016 and 2017 was accounted for Hodgkin’s lymphoma; a similar result was obtained for the cost of therapy based on high-tech medical care. Conclusion. In 2017, the total number of patients with malignant LPD in the Russian Federation increased by 2.65% as compared to 2016, while the proportion of primary LPD decreased by 1.2%. In 2017, the total costs of drug supply in patients with malignant LPD in the RF increased by 55.35% as compared with 2016. Introduction. A number of drugs, which improve overall survival and quality of patients’ life, became available for treatment of metastatic castration-resistant prostate cancer (mCRPC). enzalutamide and abiraterone are the only two hormonal drugs increasing survival and approved for the treatment of mCRPC patients in Russia. The aim of the current study was to develop a pharmacoeconomic tool that calculates direct medical costs (price of the drugs) of using enzalutamide or abiraterone for treatment of chemotherapy-naïve patients with mCRPC from the Russian regional healthcare systems perspective. Materials and methods. The calculator is based on a published pharmacoeconomic model of using enzalutamide or abiraterone for the 1st line treatment of mCRPC. Current regional medication prices, which explain the biggest share of direct medical treatment costs, are automatically accounted for 84 Russian regions (except nenetsky AO). The calculator also provides estimates of number of chemotherapy-naïve patients, who are eligible for enzalutamide or abiraterone treatment in each region. Results. Costs of using enzalutamide or abiraterone are almost equal on the federal level, but the differences in the costs between these two medications are higher than 10% in 15 Russian regions. Conclusions. Possible differences in costs of using enzalutamide or abiraterone should be accounted during planning of state procurements on the regional level. The aim of the study is to determine the limits of using the mathematical-statistical analysis for the evaluation of pharmacotherapy costs in pediatric inpatients diagnosed with community-acquired pneumonia. Materials and methods. The report is based on the assessment of 547 medical records of patients with community-acquired pneumonia, who underwent the treatment in four pediatric hospitals in St. Petersburg. The data array was created from a number of factors that characterize the patients’ profile (gender, duration of hospital stay, cost of therapy, number of prescribed drugs, number of affected lung segments, pathogen location, leukocyte count, and eSR). Results. Correlation analysis allowed us to identify factors contributing to the cost of pharmacotherapy (at a significance of p=0.05); those were: the duration of hospital stay (r=0.34), the number of prescribed drugs (r=0.26), and the number of affected lung segments (r=0.21). Dispersion analysis of qualitative factors (gender, location of pneumonic infiltrate) showed no significant impact of these factors on the costs or the number of prescribed drugs in the total data set. From the regression analysis, we obtained formulas for the dependence of the resulting parameters (cost of pharmacotherapy, number of prescribed drugs) on a set of independent variables. Conclusion. The treatment cost optimization in pediatric patients with community-acquired pneumonia should include the use of antibacterial drugs with proven efficacy and safety, as well as a reduction in non-necessary supporting therapy, e.g., medications aimed to correct morphological and functional changes in the respiratory system. Fabry disease (FD) is a severe lysosome storage disease caused by congenital deficiency of the enzyme α-galactosidase A and characterized by the risk of renal failure combined with cardiovascular and CNS complications. According to the currently available information, the early start of enzyme replacement therapy (ERT) leads to a significant improvement in patient’s condition. The aim of the study is to assess whether the timely ERT prevents severe FD complications and to calculate the number of prevented cases as depending on the time of ERT start. Materials and methods. The proposed model is based on the published results on patients with FD, receiving agalsidase alpha as ERT (no data for agalsidase beta was found). The expected number of cases with life-threatening complications was calculated for different starting timepoints and durations of the ERT. Results. In patients with FD, continuous ERT during five years reduces the number of serious cardiovascular and renal complications by 25%. An early start of ERT makes it possible to additionally (as compared with a late start) prevent the complications in more than 20% of cases. Conclusion. The early initiation of RPT in patients with FD can significantly reduce the occurrence of severe lifethreatening complications, increase the patients’ survival and improve their quality of life. The article discusses some of the shortcomings in financial statistical reports provided by medical organizations in the healthcare sector, namely: duplication and intersection of indicators in different reporting forms, the inconvenient data format for their presentation and analysis, the lack of correlation between indicators of statistical reporting and internal management accounting. To solve these problems, the authors propose the ways of improving the financial reporting by medical organizations: among them, optimizing the system of indicators, abandoning the statistical reporting forms in favor of creating databases (possibly, with outsourcing assistance), as well as creating the uniform rules for maintaining internal management accounting in medical organizations. Patient registers are an effective tool for monitoring the disease incidence in the population and the effectiveness of medical care provided to patients. The registers also represent a source of information for making organizational decisions on the healthcare system. The aim of this study is to review the regulatory and legal acts governing the patient registers, and compare them with the registers of compulsory medical insurance (CMI) accounts to assess the possibility of integrating the data into a unified registry based on the CMI accounts. The article reviews international methodological guidelines, regulatory documents and existing approaches to the determination of the costeffectiveness threshold (CeT), also known as the willingness-to-pay threshold (WTP), the threshold value of the incremental cost-effectiveness ratio (ICeR), in europe (england and Wales, Scotland, Ireland, France, Belgium, Denmark, the netherlands, Germany, Sweden, Finland, norway, Poland), America (the USA, Canada, Brazil), Asia (Japan, South korea, Taiwan, Thailand), in Australia and new Zealand. The CeT is commonly used to rationalize decision-making in health cost reimbursement. The present review demonstrates that just a few countries (englandandWales,Thailand,Poland,USA) have introduced the explicit value of CeT into their decision making. Some countries (Australia,Canada,new Zealand, thenetherlands,Sweden, andBrazil) use CeT in an implicit manner implying that no specific CeT value is defined by law. In other countries (Finland,Sweden,norway,France,Germany,Denmark,Japan,South korea,Taiwan), the role of the threshold in health reimbursement remains uncertain despite the presence of HTA systems. The CeT is expressed as additional cost per unit of incremental health benefit, which is represented by quality-adjusted life year (QALY) in most counties. However,PolandandBrazilallow using life years gained (LYG) as a measure of additional benefit neglecting the quality of life. In thenetherlandsandengland, different CeT values are applied to the health technology under assessment depending on the severity or rareness of the disease and some other factors. The review outlines the main legislative aspects of organization and financial support of health services for public institution employees inRussia. Specifically, the review describes the legal framework and regulations of healthcare for servicepersons and other staff within the Ministry of Defense of theRussian Federation. 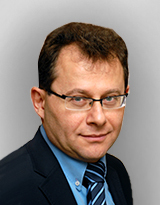 We discuss the financing mechanisms of the departmental health service in the Ministry of Defense. Conclusions are made on the need to improve the legislative base of financial and administrative support of healthcare for the military and associated personnel. To reduce maternal mortality, it is important to analyze the clinical conditions posing a potential threat to pregnant women. To characterize such states, the definition was introduced – “maternal morbidity, which almost took the woman’s life” (the near miss maternal morbidity), or the “near miss”. The “near miss” criteria were first defined in 2009. This review article provides a rationale for auditing the “near miss” cases for the purposes of healthcare technologies asessment. The paper also discusses the clinical and economic aspects of “near miss” analysis and the methodology for assessing the “near miss” incidence. Also of scientific and practical interest is the classification of maternal “near miss” cases developed by our colleagues from theRostovPerinatalCenter. Thus, maternal “near miss” cases are divided into obstetric (emergency), extragenital, planned (managed), organizational, and iatrogenic. This differentiated approach to the maternal critical conditions allows us to understand not only their causes, but also to develop a plan of further actions for each specific group. This contributes to the development of rehabilitation and prevention measures to be taken during subsequent pregnancies.